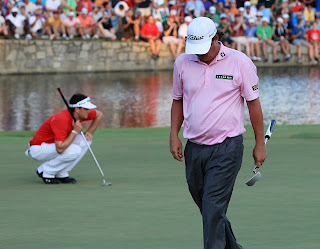 Keegan Bradley lines up his winning putt as a dejected Jason Dufner walks off the 18th green at the PGA Championship. Photo courtesy of McClatchy-Tribune News Services. The PGA Championship always will be the least glamorous of the four majors. It's the second youngest, but it also doesn't possess the aura and mystique that Augusta National and the Masters provides each spring. The tournament is also the only one of the four major championships exclusively for the pros, meaning amateurs are not welcomed no matter how good they are. So it wasn't all that surprising to witness Sunday's final round battled between a journeyman and a rookie. (Spoiler alert: the rookie, in this case Keegan Bradley, won). Bradley caught fire at the right time and watched as Jason Dufner turned into a duffer befit for once a week duties on the links. Dufner imploded down the stretch, losing a four shot lead with four to play and then had to square off against the inferno known as Bradley in the PGA Championship's three-hole playoff system. Even though Dufner three-putted the second extra hole to fall two shots behind with one playoff hole remaining at the Atlanta Athletic Club, he still provided the everyman pro some hope. His incredible week was marred by that finish, but he still hit a deft approach on the first playoff hole to generate excitement among the thousands in attendance. Of course his Wanamaker Trophy bid went almost as soon as that putt was pulled left. Then there's Bradley, who birdied Nos. 16, 17 and almost curled in a bomb on the difficult par-4 18th. If he had made that putt, it would have marked the first time all week that any player birdied three straight holes at any point during the 72-hole tournament. But alas, he birdied the first playoff hole and routinely parred out to claim a two-shot playoff victory and net his maiden major triumph in his first ever major start. Bradley's historic day put him in an exclusive club. Only Ben Curtis (2003 British Open) and the legendary Francis Ouimet (1913 United States Open) claimed a major title in their first time playing a major. The only question from Sunday's thrilling end was, did anyone bother to watch? I have to admit, before Sunday's end, I probably watched about five minutes of action. Five minutes in total. All week. With Tiger Woods looking like he should call it quits before he hits 40 years old, the viewership numbers shouldn't be eye-popping. Woods missed the cut badly, and with him off the weekend coverage a decrease in audience figures is almost a guarantee. But golf won this week, regardless. We had a dramatic ending, and an American won the tournament. That's saying something, since the fourth different major champion this year (Bradley) ended an American drought in the majors. Not since the 2010 Masters, when Phil Mickelson won another green jacket, had an American hoisted a major championship. But the question still remains: did you watch the PGA Championship? Vote in the new poll located on the right-hand side.